Television chefs often bring less common foods to the attention of their viewers and it was only a matter of time before squash soup moved from wherever it had been hiding to a dish with cachet. 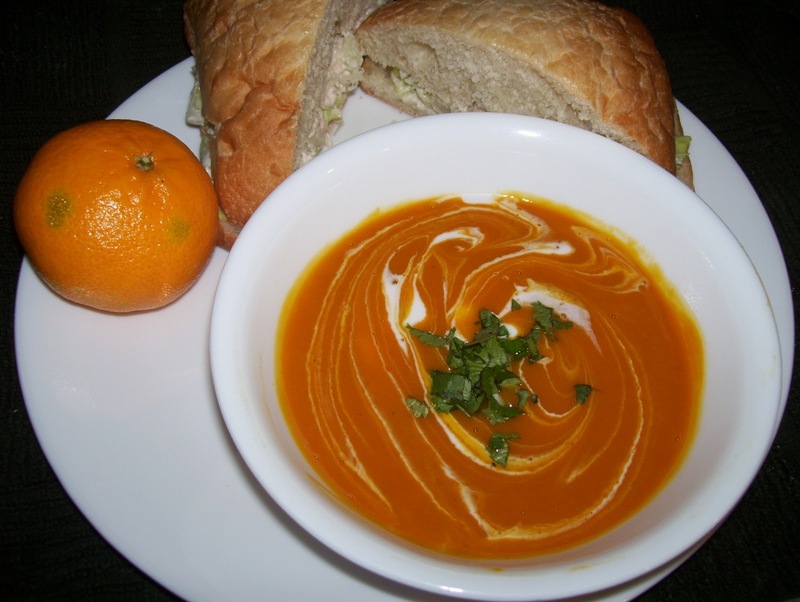 Today, you can find it everywhere...as the soup-of-the-day in restaurants, attractively packaged in gourmet food stores and even lined up in the canned-soup section of neighborhood groceries. Squash soup is tasty and goes surprisingly well with other flavors. Many recipes suggest the addition of various meats, seafood and vegetables to this beautiful, gold-colored liquid to make it more than just pureed squash. Today's recipe adds something quite surprising and simple, yet from the first sip to the last...it is a tantalizing combination of flavors. The presentation is beautiful and artistically easy. 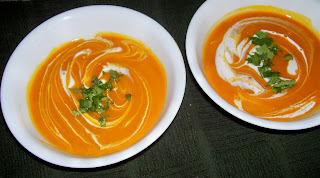 The first time I served this soup to my husband, he did not know what had been used to create the beautiful white swirls until he put that first delicious spoonful into his mouth! All could say was, "Wow!" Coarsely chop onion and garlic and set aside. Peel squash and cut flesh into 1-inch cubes. In a pot over medium heat, add ¼ C broth and simmer onion until tender, about 7 minutes. Stir occasionally. (Add more broth if necessary to keep vegetables from scorching). Add garlic, ginger, turmeric and curry and mix well. Add squash and remaining broth and mix well. Bring to a boil and simmer partly covered until squash is tender (about 15 minutes). Spoon 1/3 of the cooked vegetables into a blender or Vita Mix with enough broth to make a smooth, pourable mixture. Put blended squash into a bowl and continue with remaining batches of squash. Include as much of the onion and garlic as possible when spooning the squash into the blender. There will be some broth left in the pot that you may or may not use depending on how thick you want your soup. Spoon pureed squash soup into bowls and add three to four ½ tsp of coconut cream in little puddles on top of the soup. Drag a spoon through each puddle to create a decorative swirl effect. Add chopped cilantro to the center of the bowl of soup. Serve immediately.